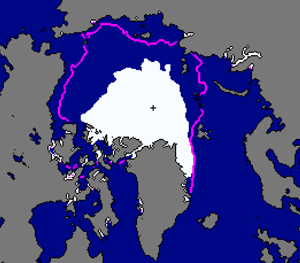 Arctic sea ice extent for September 2012 was 3.61 million square kilometers (1.39 million square miles). The magenta line shows the 1979 to 2000 median extent for that month. The black cross indicates the geographic North Pole. The Arctic region is warmer than it used to be and it continues to get warmer. Over the past 30 years, it has warmed more than any other region on earth. Most scientists agree that Arctic weather and climate are changing because of human-caused climate change. Arctic warming is causing changes to sea ice, snow cover, and the extent of permafrost in the Arctic. In the first half of 2010, air temperatures in the Arctic were 4° Celsius (7° Fahrenheit) warmer than the 1968 to 1996 reference period, according to NOAA. Satellite data show that over the past 30 years, Arctic sea ice cover has declined by 30 percent in September, the month that marks the end of the summer melt season. Satellite data also show that snow cover over land in the Arctic has decreased, and glaciers in Greenland and northern Canada are retreating. In addition, frozen ground in the Arctic has started to thaw out. Scientists first started to see changes in the Arctic climate in the 1970s and 1980s. Scientists are studying the many factors that influence Arctic climate to help figure out how feedbacks work and what will happen in the future. Researchers are also investigating how the changes in the Arctic climate will affect climate in other parts of the world. Scientists study data collected by satellites and at ground stations and also used use sophisticated computer models. This image shows trends in mean surface air temperature over the period 1960 to 2011. 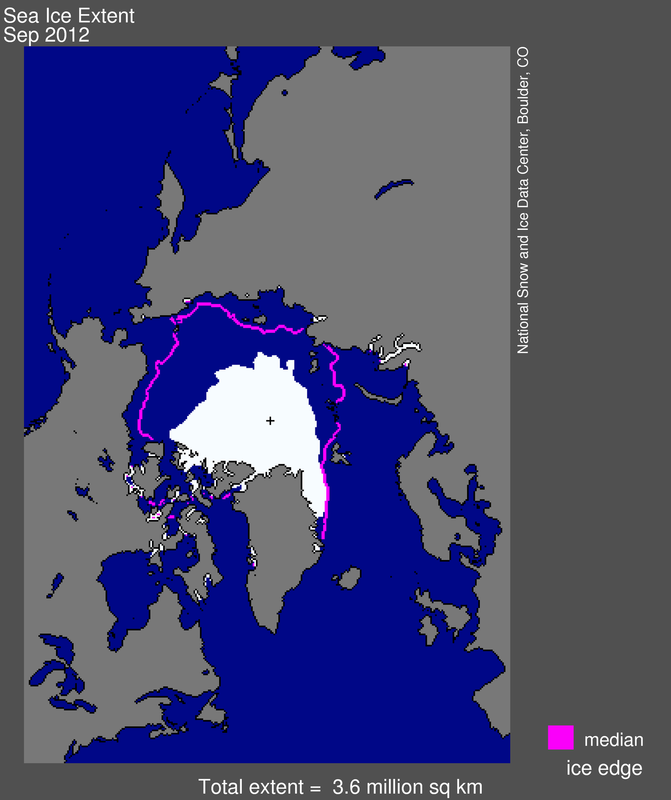 Notice that the Arctic is red, indicating that the trend over this 50 year period is for an increase in air temperature of more that 2° C (3.6° F) across much of the Arctic, which is larger than for other parts of the globe. The inset shows linear trends over the period by latitude.